How many traditional breads of the world can you name? You're about to add 1 more to your list! 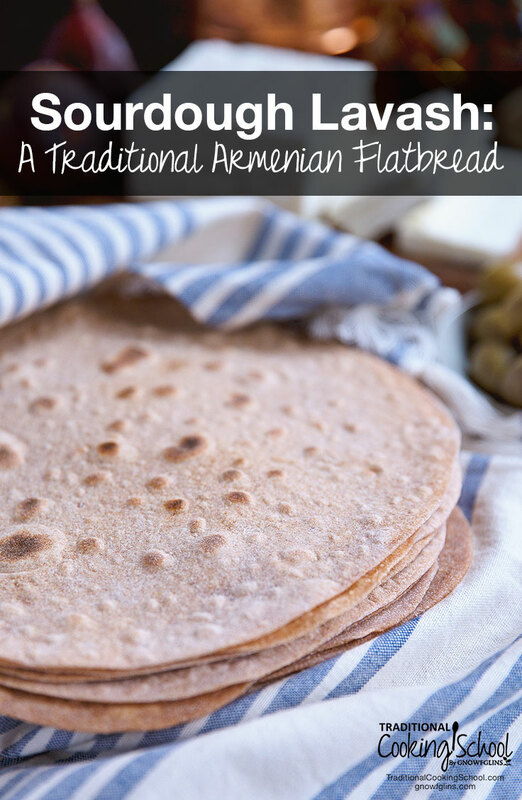 It's an ancient Armenian flatbread — popular throughout the Caucasus and Middle East. We can trace it back as far as the 6th century! Well, in traditional cultures, factors like climate, natural resources, and mobility influenced the shape and functionality of their ovens. This, in turn, determined the appearance of their breads. An Armenian oven is called tonir (similar to tandoor). It looks like a large clay cylinder that sits in the ground. Women roll their dough, stretch it paper thin, then slap it onto the sides of tonir. In this way, lavash bakes very quickly against the high temperature, staying light in overall color with dark, charred blisters. Sourdough lavash is very versatile! Traditionally, it made a wrap for salty cheeses, greens, and herbs. It also makes a great crunchy snack if dried. Once dry, it has a long shelf life and can be rehydrated again easily. Or, use it as a plate! Pile on some rice, meat, or veggies, and use another piece of lavash as a spoon. Of course, modern conveniences make this unnecessary but it's a neat historic fact all the same. Some recipes use flour, hot water, starter, and salt. Others suggest matsoni, a fermented dairy drink, instead of water. Most agree that fermentation should be short: 3 to 4 hours in a warm, if not hot, environment. I decided to go with fermented milk. Instead of matsoni yogurt — which is hard to come by — I substituted homemade whole milk kefir. Although I tried einkorn flour first, the lavash came out too brittle. So, on to my next favorite — spelt — which also happens to be the abundant grain in the Caucasus for generations, worked wonderfully. I also used a cast iron skillet instead of a stone in the oven. The main goal is to have an evenly heated surface — as opposed to a thin frying pan. While the oldest cultivated variety of wheat is einkorn, spelt is still one of the oldest! Unlike einkorn, it grew throughout a much larger area: from Europe to the Middle East to Russia's northeast. It performs similarly to modern wheat in baking. And yet, it is far superior nutritionally. If your family isn't crazy about whole grain breads, this sourdough lavash might make them rethink their priorities! 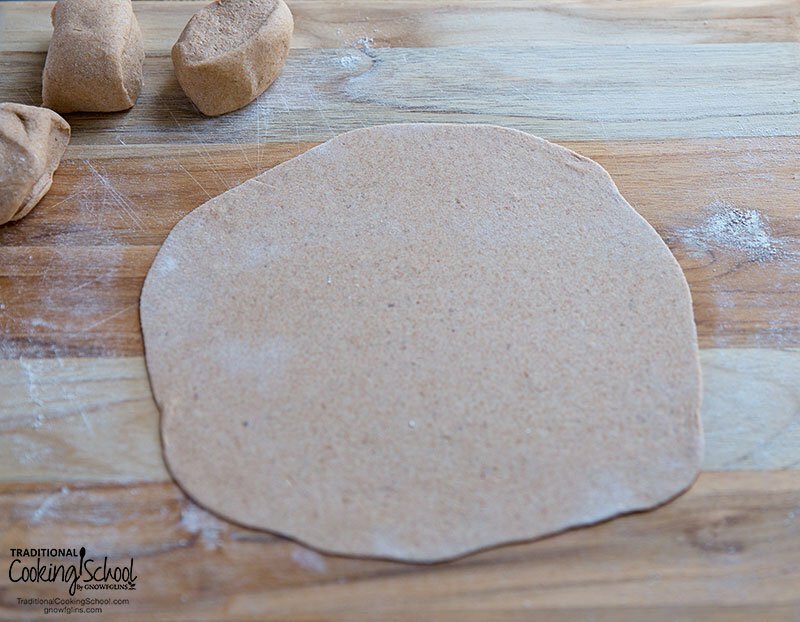 This flatbread is mild in flavor, thin, flexible, and perfect for kids! Sourdough lavash is an ancient Armenian flatbread -- popular throughout the Caucasus and Middle East. Use it as a wrap for cheeses, greens, and herbs, or dry it for a crunchy snack! Or, use it as a plate. Pile on some rice, meat, or veggies, and use another piece of lavash as a spoon. Makes 12 flat breads. Whisk together kefir and sourdough starter. Add sifted spelt flour and salt. Next, knead by hand (or in stand mixer fitted with a dough hook attachment) until the dough becomes nice and pliable and absorbs all the dry bits. Then leave in the warmest place of your house for 3 to 4 hours. The goal is not to sour or raise the dough, but to condition, soften, and strengthen it. Sprinkle the dough with flour. I use all-purpose spelt flour at this point because whole grain is a bit rough for rolling. Give it a couple of hand kneads. Then transfer to a well floured work surface. Preheat a large cast iron skillet. Divide the dough in 12 pieces. Cover the pieces you are not using, to prevent drying. Roll each piece out to 1/8" thick circles. Slightly stretch it by hand when you transfer it to the skillet. This helps to prevent air pockets. Then cook each lavash on medium to medium high heat for a minute or less. Adjust heat as needed. It will take some practice to find out the best setting for you. You want lavash breads to have dark spots. If the spots don't appear, the skillet is not hot enough. That would make breads too brittle. Finally, once cooked, cool lavash between 2 towels to prevent moisture from escaping. 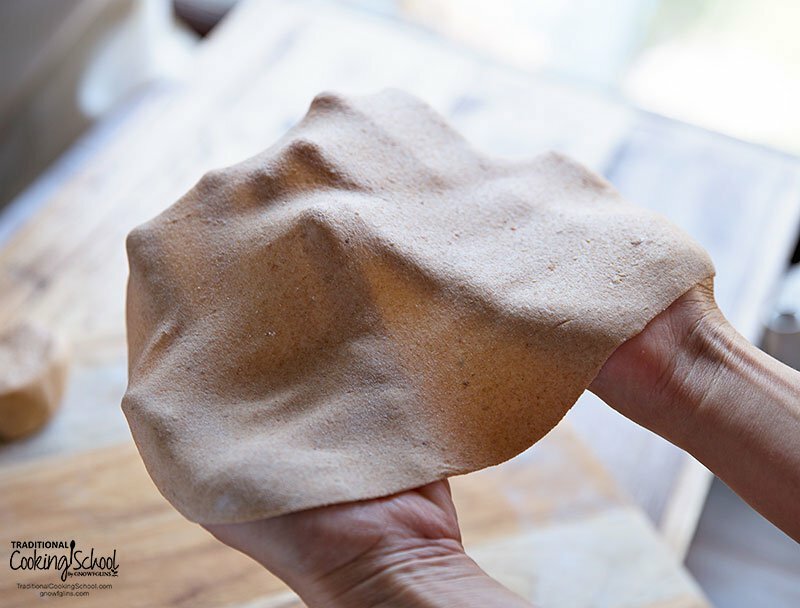 *If you want crisp lavash, either cook it longer, or leave it uncovered after baking. *White all-purpose spelt flour also works well in this recipe. 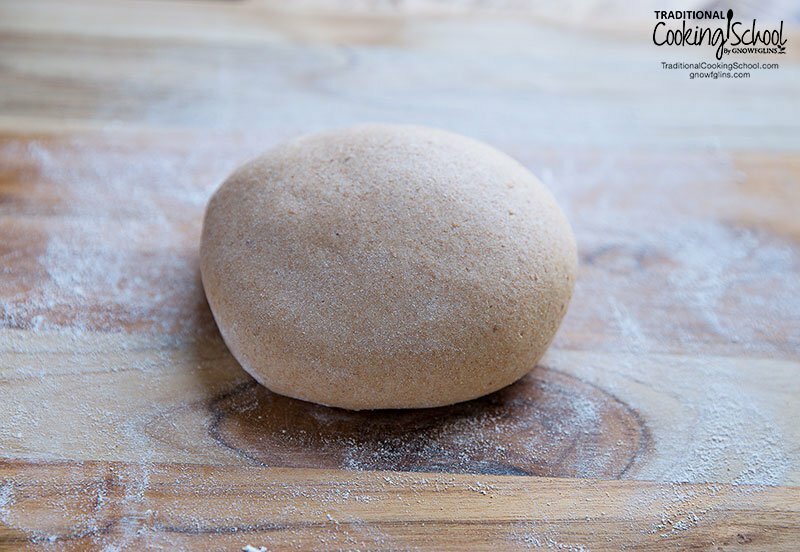 *If using water instead of kefir, add a tablespoon of olive oil to the dough. It will make it easier to handle. 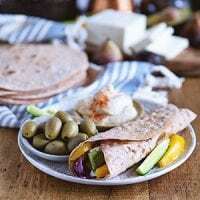 Are you familiar with lavash? Have you ever made it before? What is your favorite flatbread? 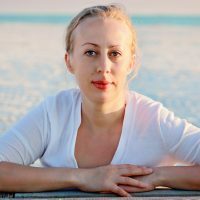 This post was featured in 47 Trim Healthy Mama E Meals & Snacks With Traditional Foods and 60 Easy & Nourishing Picnic Recipes. Can I use a wheat starter or even omit the sourdough starter altogether for a similar result? Hi Kim, you can definitely use a wheat starter, and yes, you can skip it as well. If you skip it, maybe let the dough rest longer, l’d say 6 hours or so. This appears to be pretty similar to my Mexican flour tortilla. I can’t wait to try it! The temperature here in Reedley, Ca. Central California area, is cooling off now. So I will start a starter! Let you know how it goes. . . I need to avoid gluten, therefore rye or wheat starters are no good. Any suggestions? This has become a staple in our house that we use for almost everything – dipping in soup, making “burritos” with scrambled eggs or chicken salad or whatever is on our plates, and the kids’ favorite – rolled up with peanut butter and raisins inside! Another staple in our house in your oat kvass recipe. I’ve had it on the counter for several months now. Next on my list to try is fermented lingonberries – I recently found some at a local European grocery store. That same week I found lingonberry bushes for sale at a local plant nursery, so put one in my garden, too. Thanks! I’m always looking forward to your next recipe! Can we make the Lavash bread on a baking stone? What would be a difference if we do it on a skillet? For gluten free breads, flat breads in particular, I use buckwheat, and garbanzo bean flour. Bob’s Red Mill has several gluten free flours, and flour bends each having their own unique flavor. But the texture will never match gluten containing flours, gluten is what gives bread the stretch to rise but that’s really all it does, I don’t think it has much flavor of it’s own. I think the flavors come from the grain used, yeast/leavening, and other ingredients.